Flexible storage solutions for the home or office. Built entirely from laminated, molded and cross-ply plywood, Multiflex casegoods are lightweight and strong. 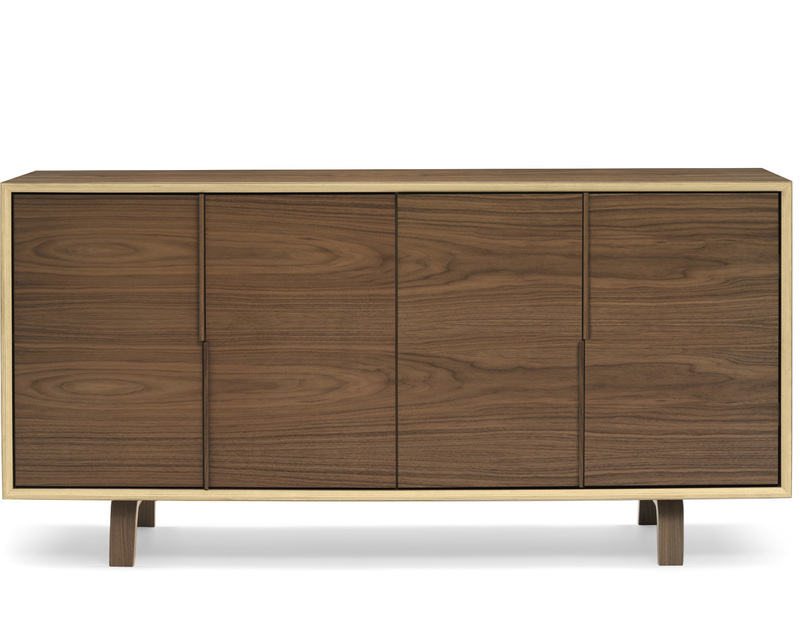 Clear finish walnut veneers and contrasting edge laminations create a strong geometry and highlight the handcrafted mitered joinery. Available in a range of unit sizes and storage configurations to fit almost any need. Made in the U.S.A. 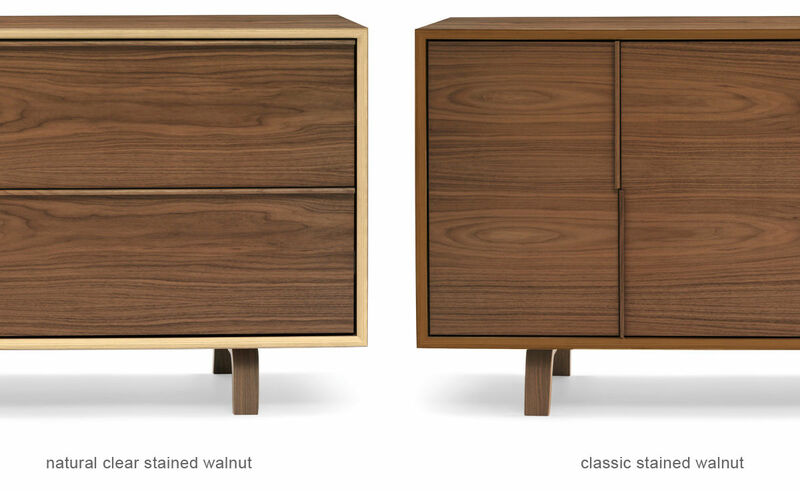 The "classic stained walnut" option have a stain applied to both the beech core and the walnut face veneer which gives the product a uniform walnut color (very little contrast in color between the beech core and the walnut veneer). 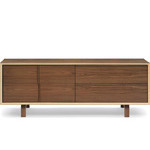 The "natural clear stained walnut" option have only a clear finish applied, which emphasizes the contrast between the exposed beech core and walnut face veneer. The Multiflex storage pieces are available in 60" lengths and 20" depths with either 29" or 21" heights. They feature a 3/4" multi-ply plywood case, 1/2" multi-ply plywood drawer boxes, 3/4" multi-ply plywood drawer faces with molded plywood pulls and legs, full extension drawer slides and full overlay 3/4" multi-ply plywood doors. All components have exposed ply edges. 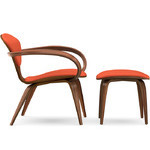 $3,599.00 + free shipping in the continental U.S.
Benjamin Cherner is the son of the furniture designer Norman Cherner and co-founder of the Cherner Chair Company, sole authorized licensor of Norman Cherner’s designs. Benjamin heads the multi-disciplinary design studio Chernerdesign and designed the Cherner Table, inspired by and made to correspond with his father’s famous pieces. His most recent work, a duplex penthouse in New York's East Village has been featured in Dwell magazine and the New York Open House tour. Benjamin Cherner is a registered Architect in New York and Connecticut and holds degrees in Architecture from Arizona State university and Columbia University. He lives in New York City with his wife the landscape architect Emma O'Neill, and their two children Zelda and Bram. 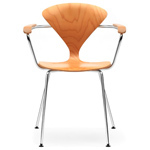 Norman Cherner experimented in all aspects of design, including glassware, lighting, graphics and furniture. He was also one of the pioneering architects behind America's first pre-fabricated houses, which began to appear during the 1950’s. 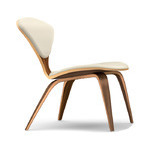 However, for the past 50 years, it was Cherner's molded plywood chairs that have helped make him a household name, as they have appeared in numerous different hotels, restaurants and homes around the world. 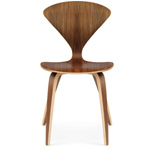 In 1999, Norman’s sons Benjamin and Thomas Cherner formed the Cherner Chair Company to reissue their father’s designs. 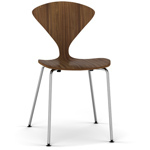 In addition to the popular molded plywood chairs, the company features new designs from Benjamin Cherner.